The Piriformis muscle: who has heard of it? Not many of you probably. Even fewer of us know where the Piriformis muscle is or what the Piriformis muscle does…. but if you have problems with it you really know about it. So I thought it would be useful for us all to get a little better acquainted with this tremendously important and tricksy little muscle. When the thigh bones is extended back relative to the pelvis, then the action of the Piriformis is to rotate the thigh bone outwards. External rotation of the thigh bone, to put it another way. When the thigh bone is flexed forwards relative to the pelvis then the action of the Piriformis is changed – it takes the thigh bone out to the side. This role is an important one in walking because it helps to maintain balance. Quirkily (or do I mean twerkily?) it has another function if the thigh is flexed higher up than the pelvis: it rotates the thigh bone inwards. Here is the Piriformis shown attached to the sacrum (the base of the spine) on one side and the thigh bone on the other. On route it has to pass across and attach to the inside surface of the pelvis. It forms a kind of “back wall” of the pelvis, as opposed to the floor of the pelvis. Also pictured are the other outward rotators. The sciatic nerve exits the spine cord and passes right underneath the Piriformis muscle. In around 15- 18% of the population the anatomy of the muscle is such that the nerve runs straight through the belly of the muscle rather than underneath it. How many of us are chronically turned out at the hip? 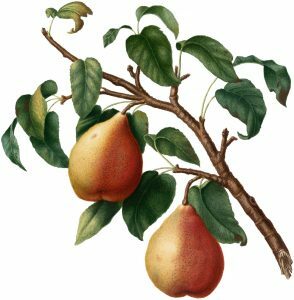 The most obvious appearance of this is that the feet are pointing outwards and away from each other rather than being in parallel. It is a lot of us, a lot of the time. For some people it is constant feature of their gait both in standing and in walking. Because the muscle has an important function in gait, for walking and running, runners are prone to having a tight Piriformis. The upshot of this is that the Piriformis can get overworked and/or tight and/or be in spasm and/or be pulled out of alignment. Of course lots of muscles can be overworked and tight. It is the position of the Piriformis that is significant. 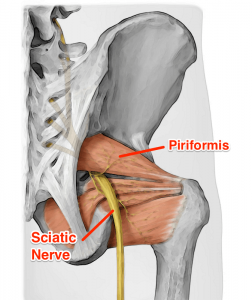 An irritated Piriformis can irritate the Sciatic nerve and cause sciatica: pain and irritation in the same way that bulging discs can cause the same problem. The symptoms can be pain, numbness and tingling deep in the buttocks or anywhere along the sciatic nerve as is travels down to the foot. Potentially prolonged sitting, stretching, climbing stairs, and performing squats may increase the pain. First of all, if you suspect that you might have Piriformis syndrome, get it checked out by a Clinician – a Physiotherapist or Osteopath. That way you can be more certain of your diagnosis and exclude other potential causes of the pain you might be experiencing. If a diagnosis of Piriformis syndrome is confirmed or at the very least, that is what is assumed, then a programme of stretching is the most likely course of action. Here are three clips of me doing a quick run through of ways to stretch the muscle. Here is a link to the NHS website with a Physiotherapist talking about the same types of stretching. I’ve chosen this link because it is UK based and also NHS endorsed to overcome the randomness of the internet. Gentle strength work. If stretching works then the muscle will become more relaxed, and lengthened. The muscle may also need some re-training in order to gain strength in its newly lengthened position. Here is a clip of a good, basic strength exercises for Piriformis. And if Stretching Doesn’t Work? Go back and visit your Physical Therapist, or make an appointment to see one. Maybe the Piriformis is in spasm rather than merely tight. This requires an anti spasm rather than a stretch – and a separate blog post. Watch this space! keep the pelvis moving freely. Pelvic clocks/rolls in lying, all fours, seated or standing. Any one for a Waltz? Slow Fox Trot? Don’t just watch Strictly. Be Strictly! watch that you don’t get too tight at the front of the hips. Stretch the hip flexors. And then some. And then some more. runners, consider your gait and your technique. cyclists too, especially when using the static gym bikes. The legs and knees should be parallel and beside the bike, not sticking out on an angle and the back should be neutral and hinged forwards at the hip joint not rounded. The pelvis should be stable and level when you are cycling, not rocking side to side. practice standing and sitting with the feet and legs in a parallel stance and learn to be comfortable with it.